newer bottles come with the same urinary tract warning. I wonder just how long prolonged exposure really is. As I dig a little deeper, I notice that it also contains sodium laureth sulfate, which is related to sodium lauryl sulfate. I feel this is somewhat misleading to promote a product as sodium lauryl sulfate free on the front label, while it contains sodium laureth sulfate. Is this ethical? isn’t the great product I thought it was, but it does make nice bath bubbles! Other natural bath products I have tried do not suds up they way I want, so I have settled on this product. Maybe my children don’t need bubble baths? If you bubble bath all the time, no matter with what, you’re likely to have skin issues or urinary tract infections. The sulfates are related, yes, and I too feel it is misleading. My son has a serious reaction to either one so I have to be very careful whenever we go out of our “zone” of safe bath products. California Baby has the safest bubble bath I’ve seen on the market. They even state on their website that it won’t promote bladder or yeast infections. 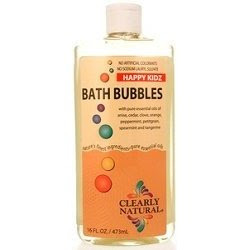 We just don’t use bubble bath since I had problems as a child and I don’t want that for my daughters. However, thanks for the recommendation, Ashley. I’ll have to look into California Baby. The kids are always pleading for bubble baths so it would be nice if I could find one. Once in a blue moon, I have used Biokleen’s dishwashing liquid to make quick bubbles for them.